Whether you need a fully operational office, super safe storage, toilet blocks or customer friendly showroom, AV Rentacabin has a unit to suit. Available in a range of sizes and interior styles, the units can be supplied with a wide range of furniture and fittings. All units are extremely well insulated and are externally finished in high-quality steel. An internal finish in vinyl coated wallboard provides a light durable and easy clean surface. Units are designed with high security in mind. Crime and vandal-resitant to keep unwelcome visitors out, and minimise overhead costs. Once again we are helping BAM Construction as they continue to add to the significant level of development taking place in the city centre. 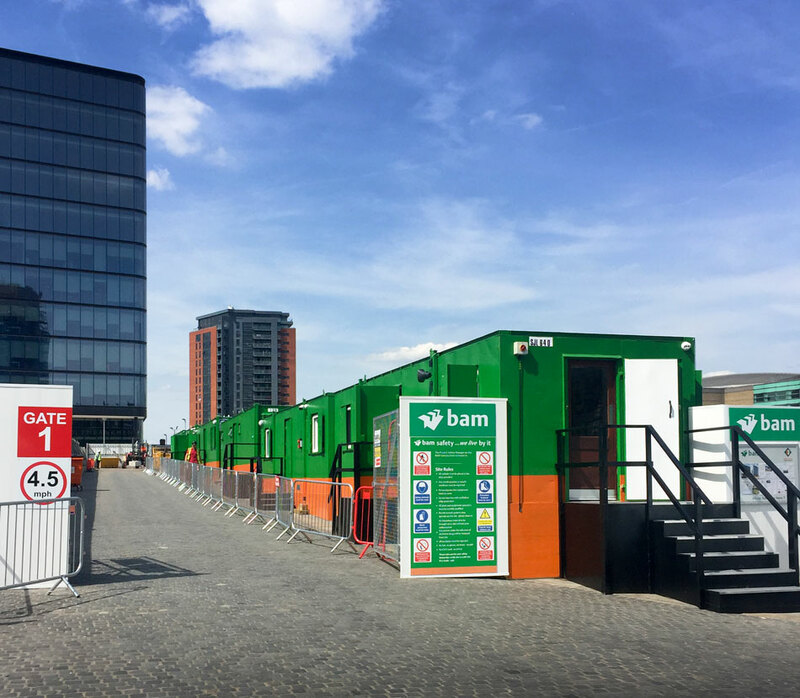 At 100 Embankment in Salford we have provided six welfare cabins, finished in BAM’s distinctive bright green and orange livery, which have been installed in a linea configuration along Cathedral Approach. The units sit in the shadow of Manchester Cathedral and just over the River Irwell, the point at which the cities of Manchester and Salford come together. The Protecta units provide a security cabin and turnstile, management office, dry room, toilet and shower facilities and a canteen. A second phase of 20 units is going on site this month which will provide additional facilities including meeting rooms, further offices and welfare accommodation. BAM is working with the JV Partnership of Salford City Council, Tristan Capital Partners and Ask Real Estate to build the second 166,000 sq ft Grade A office building at Embankment. Construction work is now well underway and 100 Embankment is due for completion in 2020. 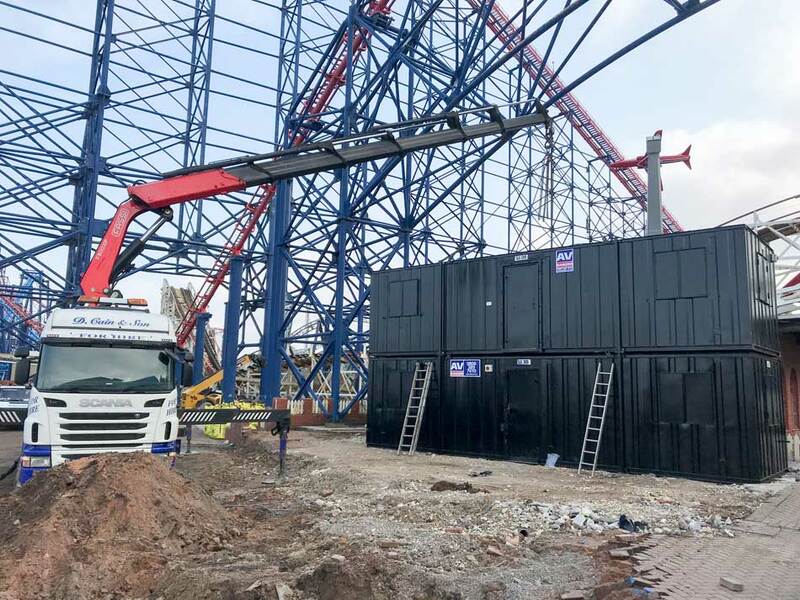 We’ve installed our welfare units in some pretty unusual places over the years, but never under one of the most famous fairground rides in the world – the amazing (and some would say scary) Big One at Blackpool Pleasure Beach. The far-from typical project is to support Truman Design and Build’s enabling works for the 120-bedroom Boulevard Hotel on Blackpool’s iconic promenade. The new-build hotel will feature a mix of family rooms, executive suites, conference facilities and a 150-cover restaurant. We were delighted to be involved in the project, supplying two units to provide office and welfare accommodation for the site team. We enlisted an 80T Hiab crane to position the modules – and for once, this usually impressive machine was dwarfed by the soaring steelwork of The Big One overhead. The installation went ahead smoothly, and the team is able to enjoy some super seaside accommodation, right at the heart of Blackpool. We are on site this month with a brand-new client: Robertson Group – one of the UK’s largest independently owned construction, infrastructure and support services companies. In a JV partnership with Lancaster City Council, Robertson is converting the grade-II listed St Leonard’s House in a programme that will create 180 new student apartments. The building had until recently been used as offices but will be totally refurbished under the £14m refurbishment programme. We have delivered and installed 8 units on hire, each branded in Robertson’s distinctive teal and white livery. They are stacked 4 on 4 and linked with an external staircase. The set up will provide welfare and office accommodation for the build team during the 2 year build programme. The installation has also been enclosed with a branded hoarding to create a safe outside compound in which to move around. The units are configured to provide office space, changing facilities, a drying room, washroom and toilets as well as induction room for training and an open plan canteen. Robertson is converting the St Leonard’s building from council offices to student accommodation which, when complete, will comprise 179 student bed spaces in a combination of self-contained studios and en-suite cluster accommodation, kitchen and recreational spaces, and a gym. It is expected that the development will complete in time for the 2019/20 academic year. 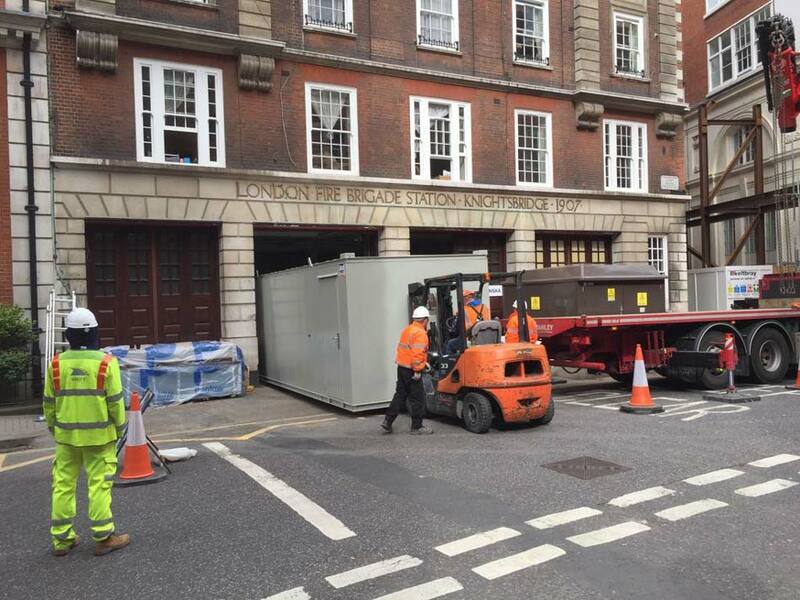 AVDanzer recently installed welfare units to support a development site in Knightsbridge, central London. The project is located in the centre of Chelsea and Knightsbridge, behind Harrods in the heart of one of the world’s best known shopping locations. The seven welfare units provided comprise an open plan canteen and drying room on the ground floor, and toilet and washroom facilities for the use of up to 300 people on the site over the next three years. This was an especially challenging project to install – space for the cabins was extremely limited, and access was made difficult due to the narrow roads and residential neighbourhood. We put in place a traffic management plan to ensure we could safely navigate the narrow roads, and cause as little disruption as possible. Traffic marshalls were provided, and parking bay restrictions placed on Basil Street where the units were off-loaded. Access into the site itself was only possible through the historic doorways of the disused Knightsbridge Fire Station. We off-loaded the units on the highway, having first carefully removed the old folding doors to increase the width and avoid any possible damage. 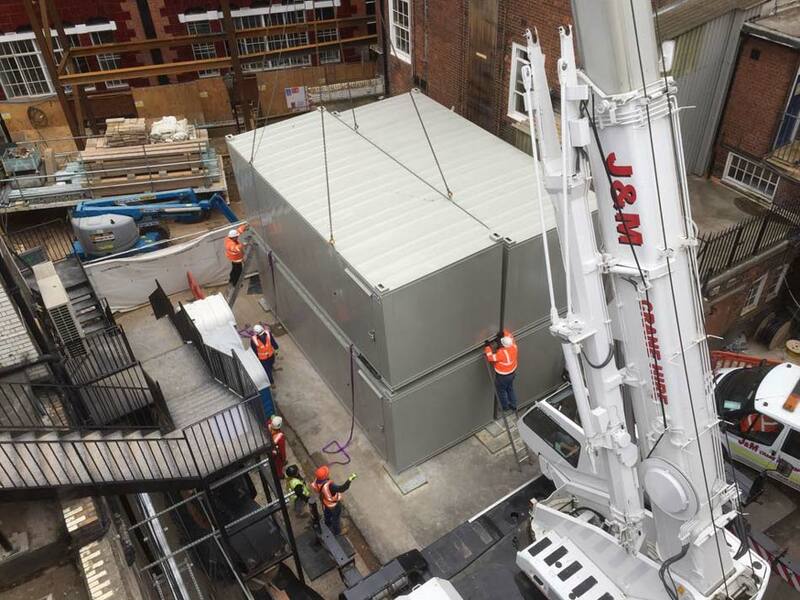 As the video shows, with only inches to spare on either side, we were able to slowly lift and slide the units through the doors and into the courtyard on the other side, using a skate system beneath the modules.